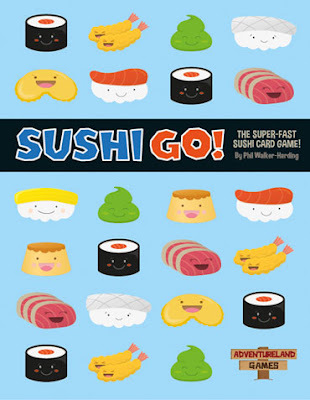 Push Your Luck Podcast: Fix'it for Dummies - Sushi Go! Each round, during the drafting phase, players each choose a card to keep and reveal them simultaneously. After which the remaining cards are passed to the player on the left/right and this continues till the round is over. Players play exactly the same way as the original rules except that each player has the choice to keep x number of cards hidden instead of revealing them each round. The number of cards that the player may keep hidden each round is dependent on the number of players in the game. *Exception: Chopstick cards cannot be hidden ! Must always be revealed. When played the original way, the game becomes an open information game. Its pretty fun as it is but I much prefer the element of surprise that the fix’it brings. With the original rule, if half the group watches their neighbors but the other half don’t, then it will lead to a runaway victory for those who are seated with the lenient half. But with the new rule, you are able to strategize more as you can make plans in secret and hope that you have fooled the opponent into passing you something that you want. I know Sushi Go is an extremely light game that the word “strategy” doesn’t have to come into play, but it’s something nice to add to a simple game anyway when it doesn’t add any extra complexity or gameplay time. Also, with the new rule, players will be able to aim for combinations that were previously harder to reach. Getting 5 Dumplings or 2 Sashimi sets is within the realm of possibility and thus adds to some excitement in the drafting phase. And believe me; you’ll be surprised by the cards that people choose to keep. It never really borders around being an “obvious” choice. Sushi Go is a popular choice with my school game club and a lot of fun - I'll be curious to see what they think of your variant. Thanks for your ideas! hi ! you're most welcome ! i hope that the variants will work well for your group too !